BIG BOOK GIVEAWAY STARTS NOVEMBER 25, WITH FIFTEEN AUTHORS GIVING AWAY 60 BOOKS! CHECK MY BLOG DAILY AND SIGN UP TO WIN. I will be a guest blogger on the following blogs, and will gift fourteen books, (e-book only) to those who make comments on these blogs. I will put all the commenters names in a bowl and let Mad Dog (that's my husband) choose fourteen of them on December 9. Whew! After this I'll need a siesta. I'll be reminding everyone of these great blogs and bloggers as we go, and good luck on winning a book or two! Can hardly wait! Looking forward to our visit! Great post. Great tour. Great auhtor interviews. Great giveaways. What's not to love?! Well done, Jinx. This is going to be fun! 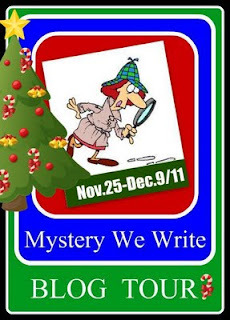 Happy Thanksgiving, Jinx, I look forward to hosting you on my Mysterious Writers site on Dec. 6, and appearing on your blog site on Nov. 27. What a fun tour this is going to be!